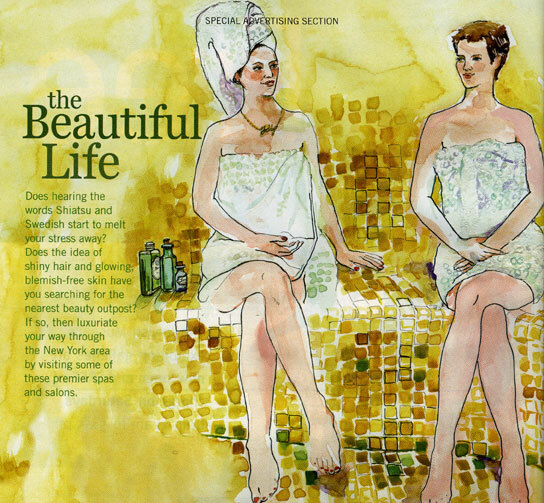 The two women on this illustration are both me, painted by Charmaine Wheatley for a 2007 advertorial in New York Magazine. I like it because I hate modeling and going to the spa–and my legs are much longer than in real life! My name is Sabine Heinlein. My husband and I moved to Sunnyside Gardens in 2008. We had scouted many neighborhoods in Brooklyn and Queens, but none of them could compete with Sunnyside. We loved the old sycamore trees, the Gardens’ feral courtyards, the many excellent ethnic restaurants and stores, their patrons and owners. The neighborhood has preserved its quaint spirit; neighbors stop to chat and inquire about each other’s wellbeing; we exchange seedlings and bulbs in the summer and shovel each other’s snow in the winter. On our block alone there live Mexican, Chinese, German, British, Irish, Puerto Rican, Bangladeshi and Pakistani residents. I’m sure there are even more cultures present and I just haven’t discovered them yet. I particularly love to walk past the houses owned by Bangladeshis and Pakistanis around dinnertime. The smell is incredible. One day, I might just have to invite myself over. An interest in discovering people’s origins, their cultures, their stories and their daily lives was what initially drew me to start the Sunnyside Sound Project. I have a keen interest in people’s quirks and I love to hear people talk about what they do and why they do it. Since Sunnyside residents always seem to be doing something, I thought it would be great to record them talking about it.Everybody in the neighborhood seemed to be doing something related to their neighborhood. Some founded a group that removes graffiti, others volunteer in beautification projects for the local park. Again others run blogs, children’s theater workshops or organize jazz concerts. When I moved here I wondered what my role in the community would be. The Sunnyside Sound Project was profiled by the New York Daily News and featured at a special event at the Sunnyside branch of the Queens Library. The library workshop was sponsored by the New York Foundation for the Arts (NYFA). The Queens Chronicle also published an article about the Sound Project but misspelled my name on several occasions. The Sunnyside Sound Project is now part of the Queens Library’s Queens Memory project.